Hops, malt, and yeast are the fun, interesting ingredients that get all of the attention and adoration of brewing. Naturally, one would think that these ingredients were key in developing regional flavors, leading to the various styles of beer. It is water, however, that creates the framework for these styles. Much like the dark matter lattice that keeps the Milky Way from spinning apart, without water, beer could not exist. Brewing journals from a hundred years ago tell of rebel brewers boring into the earth, pumping up vast supplies of water from a deep source. The ones with the biggest pumps made the most beer, and a shift in mineral composition could end your career (except Scottish brewers, who seemed to thrive on this challenge). An upstart brewer with a pure water source could stun the world with a clean, fresh brew that took your breath away. Something so simple as two hydrogen paired with an oxygen can lead to some serious mind cramps. Water has a tendency to absorb salts and minerals, so understanding exactly what you have in your water source is as simple as understanding the entire ecology all around you. Most of these minerals, chlorinates, or even toxins are regulated to be under a certain threshold for safety. What tastes great out of the tap can produce a harsh IPA or thin stout when brewed. Over time, brewers came to realize this, as when Vienna brewers added lightly kilned malt to their Pilsner recipe to keep the tannins in check. Later, Vienna lager brewing was exported to Mexico, where it gained further dark malts to compensate for the local water supply. Then Negra Modelo, and perfection. Bicarbonate (HCO3-1) This is a measure of hardness in your water supply, due to it’s amazing ability to buffer pH, specifically in a mash. The waters of Dublin are high in Bicarbonate, which is why the dark light beer Guinness was brewed with large amounts of roasted barley. The dark grains neutralized the alkalinity of the mash, resulting in a pleasing, mild, perfect-for-a-hot summer day brew. Calcium (CO+2) The soft water of Pilsen is blessed with extremely low calcium. They combine this liquor with Moravian barley and Zatec Red hops. This beer was so famous for its pale color that it ushered in an era of clear glasses to drink beer out of. Previously, ceramic mugs hid the murkiness of Grandpa’s Smokey Sour. IPAs usually have a high calcium content as well. 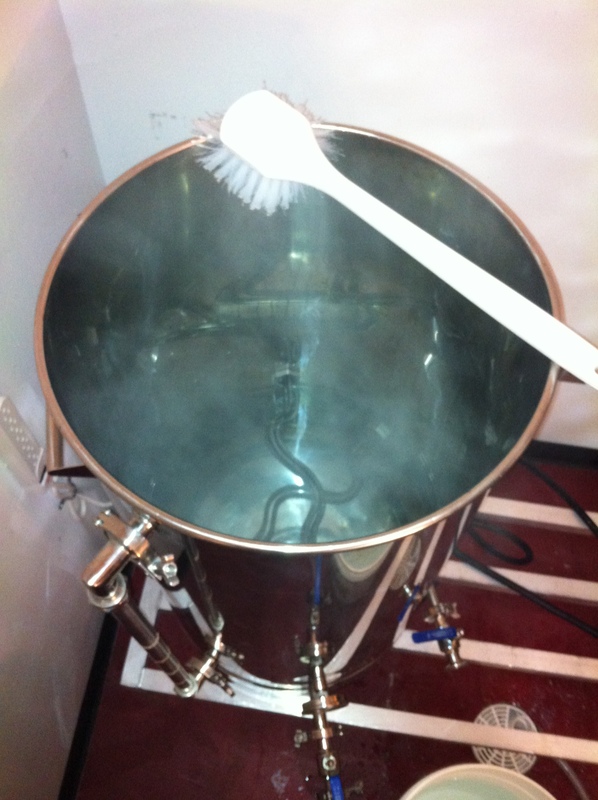 Ancient brewers used to boil their liquor overnight to precipitate calcium to the bottom of the copper. Sulfate (SO4-2) Everybody thinks smelly eggs and farts when sulfate is brought up for discussion. An unfair assumption for an important salt. Buton-on-Trent became famous for being the birthplace of India Pale Ale. Everyone knows the story: English troops in India want beer to continue their colonization of India, an elephant spills a bale of hops in a barrel, everyone rejoices in this new found libation. Although IPA cannot be the only cause of the Indian Independence Movement, it cannot be totally ruled out either. Sodium (NA+1) Google sodium and beer and the bitter beer face horn will sound, as Google shows you that all anyone cares about it how little of it is in their beer. If science is to be believed, however, this salt can supercharge your palate, helping you tasting flavors in a more intense way. Imagine a good Dortmunder Export, glistening gold in a glass, beckoning to to you to try its rich water profile of sodium (Palmer for a great article of mash pH). Chloramines (NAH2CL) Kansas City is richly blessed with chloramines in its water supply. These can be a good thing to keep water safe, but they are a detriment to brewing. Producing such wonderful flavor profiles as band-aids, plastic, eye of a newt, toe of a frog, this derivative of ammonia can be deactivated or removed by an experienced home brewer. This is a first world problem, as the ancient river of the Tigris or Euphrates did not have any chloramines for Nebuchadenzzar’s brew pub to worry about. Much as neolithic man looked to the heavens and witnessed the clockwork of the celestial bodies without understanding, so too can we make great beer without having a chemistry degree. However, knowledge can only help us in the never ending quest to make the perfect beer. Water is such a complicated and fascinating topic, such a stub of a post can hardly do it justice. Please check out John Palmer’s excellent Water: A Comprehensive Guide for Brewers and anything Greg Noonan ever wrote.